The 8th European Conference on Residual Stresses (ECRS8) follows the tradition of previous ECRS events held in Karlsruhe (1983), Darmstadt (1990), Frankfurt/Main (1992), Cluny (1996), Delft (1999), Coimbra (2002) and Berlin (2006). 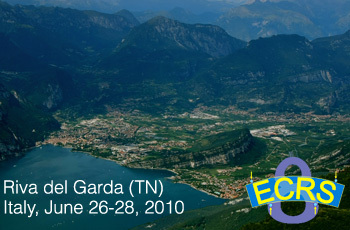 ECRS8 is the forum where the main advancements and new results in residual stress determination and modelling are presented and discussed among the main experts in this field. Main topics covered by the program are: experimental methods, including neutron and synchrotron radiation residual stress analysis, strain mapping, in situ analysis, microstrain studies, texture-stress relationships, residual stress modelling and computation, generation of residual stresses by manufacturing and processing of materials, residual stresses in thin films, coatings and in multiphase materials, residual stresses and phase transformations, grain interaction mechanisms and elasto-plastic behaviour of materials, multiscale modelling and scale bridging aspects. NEW: Deadline for paper submission extended to September 13th, 2010. The school proposes basic topics, mainly focused on diffractometric and electron microscopy techniques. This edition is proposed as a satellite event to the ECRS-8 and will be focused on Residual Stress Analysis techniques such as: X-ray and neutron diffraction, mechanical techniques, transmission electron microscopy and Raman spectroscopy.